Working in partnership with various research centers – Oxford Centre for Life-Writing (Wolfson College, Oxford University, UK), Medill School of Journalism (Northwestern University, USA), ReSIC (Université Libre de Bruxelles, Belgium), and the Experimental Media Lab (Academy of Fine Arts Saar, Germany) – the research group I.D.E.A. 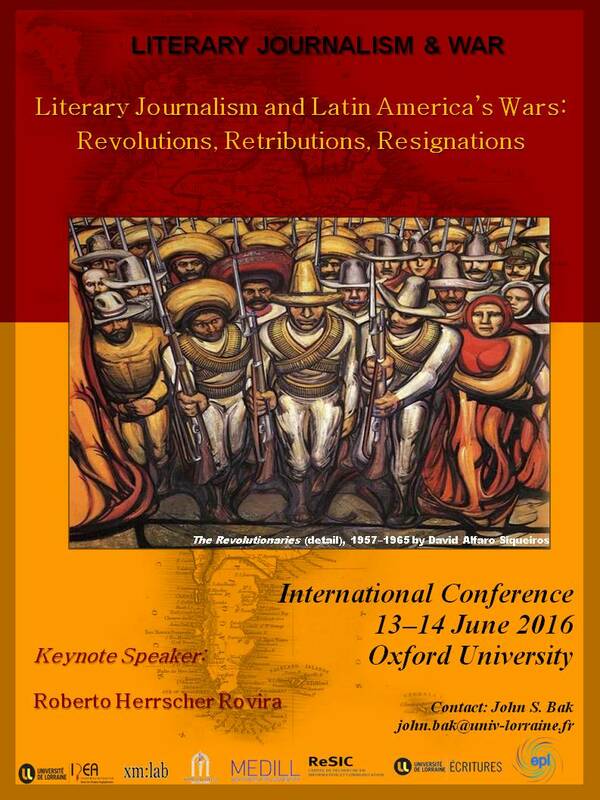 (“Théories et pratiques de l’interdisciplinarité dans les études anglophones”) is announcing a call for papers for the conference “Literary Journalism and Latin American Wars.” The conference will be held at Wolfson College, Oxford University, from 13-14 June 2016. The keynote speaker will be Argentinean journalist and scholar Roberto Herrscher Rovira (Universitat de Barcelona), whose books Los viajes del Penélope (2007) and Periodismo narrativo (2012) show the importance literary journalism has in the practice and history of Latin American letters.